We, as Americans, consume up 44 gallons of soda a year, so there is no denying we have a love affair with soda. The only issue is that it is linked to several health risks including obesity, diabetes, heart attack and stroke. It is an addiction that rivals alcohol, nicotine, and drugs, so breaking the habit can be just as hard as those mentioned. But with determination and hard work the rewards from not drinking soda can be well worth it. It contributes nothing nutritional to our bodies. Soda is jam packed with sugar and calories which do nothing but harm our body from within. It also has no vitamins or minerals that are useful to our bodies. It truly does nothing but rot us from within. It contributes to obesity and diabetes. As I mentioned earlier some of the health risks linked to soda are that it leads to a risk of obesity and diabetes. Soda is made with high fructose corn syrup, which is linked to obesity and has high amounts of sugar which raise our blood sugar levels and puts at risk for type 2 diabetes. It damages your teeth. The sugar in soda will coat your teeth, and combined with the bacteria in your mouth, it creates an acid that destroys your teeth. Soda also has carbolic acid through carbonation which will further destroy your teeth. Weaker bones. Soda also contains phosphorous and caffeine which have been linked to osteoporosis. Some people choose soda over other beverages such as milk which deprives the bones of the needed calcium to make them stronger. Harm to major organs. Your kidneys are at high risk if you consume a lot of soda as it has been linked to chronic kidney disease. Your heart is in danger as well, as soda is also linked to metabolic syndrome which is a group of symptoms that add up to increased heart risk. Finally, your liver is in play here as well with the risk of developing into fatty liver which is a chronic liver disease. Diet Soda is just as bad if not worse. Sorry, soda lovers choosing diet soda over regular soda is not a good choice. It combines all the reasons why one shouldn’t drink regular soda with the added health risks brought to you with the addition of artificial sweeteners. Artificial sweeteners confuse the body when it comes to sugar intake because it triggers the production of insulin which sends the body into fat storage mode which can lead to weight gain and a higher risk of type 2 diabetes. The artificial sweetener aspartame has been linked to headaches and migraines. Water may be the best drink to replace soda as it is a free alternative and has no calories which mean no health risks. The health benefits of water are plentiful including effects on energy levels, brain function, prevent and treat headaches, relieve constipation, treat kidney stones, and weight loss. Fruit Juice and Seltzer. Always start with 100% fruit juice but try not to drink it straight as it contains a lot of sugar. A great way to counteract this is to add seltzer water to fruit juice. Adding a splash of fruit juice to seltzer water is a great way to get the sweet you’re used to from soda as well as the fizzy effect from it as well. Milk is a great start to your morning giving your bones the calcium they need to become strong and help support your muscles. Milk can also be a great way to finish your day as a sweet treat at night. Tea is a great way to add antioxidants to your diet. No matter if you drink black, green or herbal. You can drink it hot with some honey and lemon or cold with a splash of your favorite fruit juice for an added boost of flavor and sweetness. Sugar-free powdered mixes. A great way to make plain water taste better and a healthier choice than regular or diet soda. DRY soda: Headlined by Top Chef winner Richard Blais, this soda has only four all natural ingredients and boasts low calorie and less sugar then its sugary counterpart. Blue Sky: Blue sky soda company has been making natural ingredient sodas since 1980. They have been using stevia to sweeten their drinks and have been avoiding preservatives and artificial colors. Zevia: Another soda company that uses stevia to sweeten their drinks, which if you know what stevia is, it is 100x sweeter than regular sugar without the costly effects on blood sugar levels. 12 NtM: This chef-inspired bubbly beverage has only 60 calories and 13 grams of sugar. It is a combination of citrus, ginger, cardamom, herbs, spices and a blend of three teas. Steaz: The folks over at Steaz combined green tea and soda and the results are profound. It is made from organic, fair trade certified green tea and is sweetened with stevia. It has zero calories but 100% flavor. Fever Tree: This UK-based company made this beverage pair nicely with cocktails but this drink is great on its own. It has only 6 ingredients and 17 grams of sugar. It is made from a combination of three green gingers found in Ecuador and is a natural alternative to ginger ale. Veri Soda: This 6 ingredient, organic, and chemical free beverage is sweetened with a small dose of organic cane sugar and stevia. Veri soda has produced a cola flavored beverage that may just quench your desire for the sweet and unhealthy colas we have all come to know. 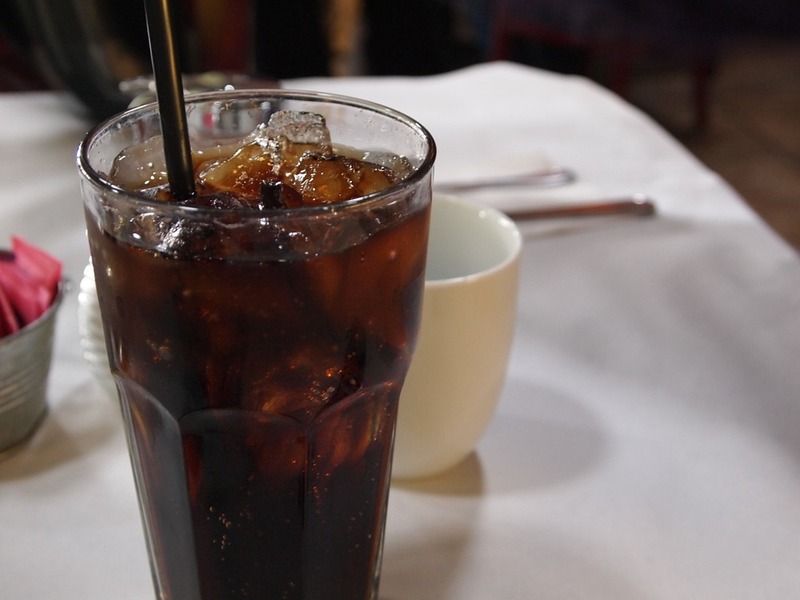 10 Reasons to Give Up Diet Soda. (2016). com. Retrieved 9 April 2016, from http://www.health.com/health/gallery/0,,20739512,00.html. 7 Sodas That Aren’t Terrible For You. (2014). Prevention. Retrieved 9 April 2016, from http://www.prevention.com/food/healthy-eating-tips/7-healthier-soda-alternatives/veri-soda. Diet Sodas Must Be Taxed As They Are Fuelling Obesity, According To Experts. (2015). Food World News. Retrieved 9 April 2016, from http://www.foodworldnews.com/articles/43765/20151014/diet-sodas-must-be-taxed-fuelling-obesity-according-to-experts.htm. Joe Leech, D. (2015). 7 Science-Based Health Benefits of Drinking Enough Water. Authority Nutrition. Retrieved 9 April 2016, from https://authoritynutrition.com/7-health-benefits-of-water/. Say No to Soda, Yes to Healthy Drinks. (2016). com. Retrieved 9 April 2016, from http://www.everydayhealth.com/diet-nutrition/say-no-to-soda.aspx. This entry was posted in Diet Tips, Food, Food Facts and tagged Coke, Health, Pop, Soda, Sugar, Sweets. Bookmark the permalink.